Hungry developer - .NET, C#, ASP.NET MVC: CKEditor example in ASP.NET MVC 3, MVC 4 application. 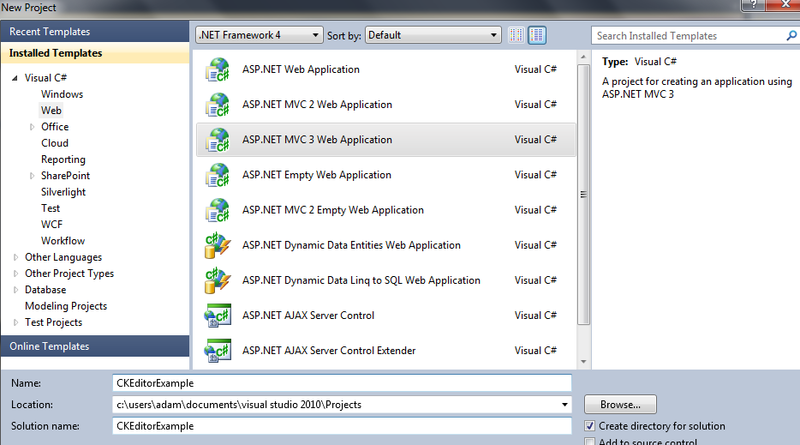 CKEditor example in ASP.NET MVC 3, MVC 4 application. 1. 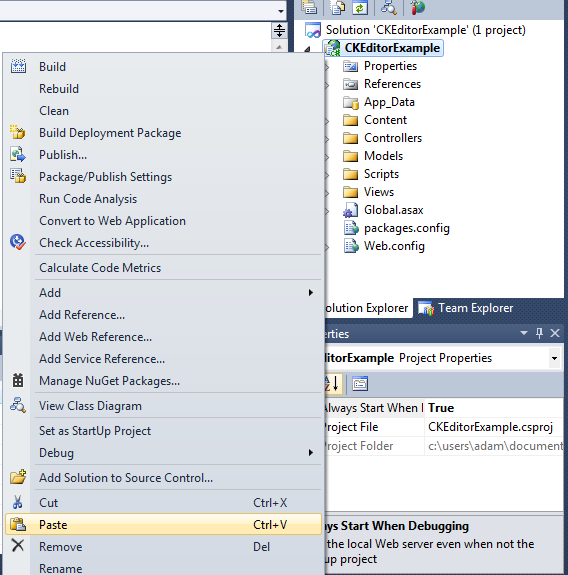 Create new ASP.NET MVC 3 Web Application project and name it CKEditor. Choose Razor view engine and internet application. 2. Go to http://ckeditor.com/download and download latest version. Unzip the file and copy ckeditor folder. 3. Inside your solution explorer right click on the name of solution and select paste. 4. Now go to Views – Shared and open _Layout.cshtml file. Inside this file we want to add reference to ckeditor.js, so we do not have to add this in every view. Please keep in mind that you have to add class “ckeditor” to every textarea you are using in your application. Field id and name are also required, otherwise ckeditor will not work. You can find attachment with complete project. How configure ckeditor in partial view? Have you added reference to ck js inside your partial view? By default partial views are not using any layout and as you can see in layout there is reference to ckeditor.js. Let me know if that save the problem. Thanks for your sharing! Very useful! That means you have to include your ckeditor.js file into the view you are using. When tried to open in showModalDialog(). It says 'ckeditor' is undefined. I would suggest to use fancy box and include ckeditor js reference or use partial view. Make sure if you are using partial view you include reference to ckeditor.js file. My project is nearly done but one function fail to work. That's the video uploader, can you please give me some advice? Nice and simple tutorial but it does not work with version 4.4.6 (25 Nov 2014). Downloaded CKEditor 3.6.6.2 (15 Jul 2014) and it works flawlessly. Did not test with CKEditor 4.3.5 (23 Apr 2014) though.